Coin! Coin! Coin! slot is possibly the simplest game I'd ever have to review. 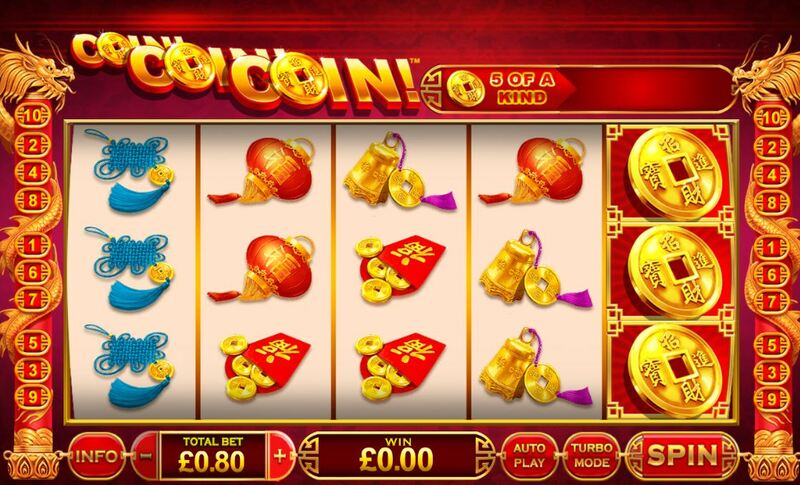 That doesn't mean it's bad to play as it was developed by an in-house company called Origins and has an oriental theme with typical Chinese music as we spin and those Novo-style trotting sounds as the reels stop. The background is a plain red and not as detailed as their other games of this theme such as Si Ling or Wu Long but the symbols look decent at least. 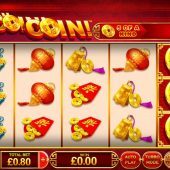 So will our bankroll see some coin-coin-coins added or will it be a case of take-take-take? We have a weird staking system on Coin Coin Coin slot because there are only 10 lines on the 5 reels of 3 rows apiece, but we must pay 80 coins to spin! I know 8 is considered lucky though in China so fair enough. The symbols all appear stacked except Wild Coins but they will expand and appear singly on all reels. The 5-of-a-kind pays are the Golden Bowls at 80x, Cat 25x, Turtle 10x, Tassel 8x, Lantern 6x, Tokens 3x and Bells 2.5x. These seven are the only standard symbols and there are no scatters as we get no feature at all here. There is a fixed jackpot and as I didn't mention a pay for 5-of-a-kind Wilds you may have guessed that this progressive will be paid for landing all 5 Wilds which will expand to fill the reels.